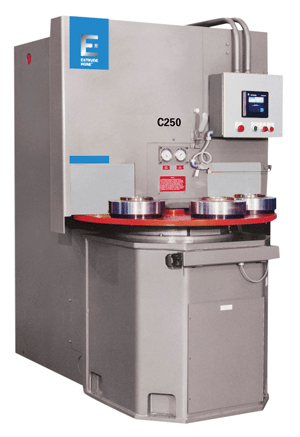 The C250 thermal deburring machine is designed to be a reliable and flexible deburring system. The C250 features a “C” throat press frame with a ram and toggle style locking mechanism that allows for fast cycle times and increased throughput. The C250 thermal deburring machine, designed for a max closing pressure of 250 US tons (2,224 kN), is available with three different chamber diameters – 7” (175mm), 8” (200mm), or 10” (250mm) – for perfectly meeting individual customer requirements. Five process stations located on an indexing table allow the C250 to perform high production deburring, while a stainless steel upper combustion chamber surrounded by a continuous flow water cooling ring ensures reliable operation. Ram and toggle provides mechanical locking of combustion chamber and fast cycle times. Convenient machine monitoring and operation. Hundreds in use in harsh environments. Redundant ignition detection by thermocouple and accelerometer feedback.